There is a long list of dishes I need my mother to prepare for me whenever I see her for any length of time. I’m not talking about holiday foods, or the fancy recipes that MoSB excels at. I’m talking about the everyday favorites that were in regular rotation when I was a kid – hot chicken salad, beef casserole, spaghetti with meatballs, italian pasta salad with vegetables, blueberry pie. Filling, nutritional (well sort of, I am including pie in this list) dishes that a busy working mom could prepare without too much fuss. In this genre of mom-food, none was more beloved t by my family than her Lemon Chicken. Probably the most healthy of the afore-mentioned bunch, Mom could make a big batch of this, pair it with any green vegetable, and we’d be happy. If a neighbor moved in or a friend was sick, you could bet a glass baking dish full of Lemon Chicken was headed their way. Like my recipe for Vodka Sauce, the proportions for Lemon Chicken don’t need to be exact, just make sure you have enough butter in your pan sauce to get a glossy finish before you pour it over the chicken. Your house will smell like you spent all day roasting a chicken, but in reality this only takes about 45 minutes to put together, including baking time. Dry chicken breasts with towel. Put flour and cheese mixture and salt and pepper in a plastic bag , coat chicken in the flour mixture, then dip in beaten egg. Heat 2 tablespoons butter and ¼ cup of canola oil in frying pan to medium high heat. Sauté chicken in batches, adding more butter or oil as needed. When chicken is browned on both sides put in single layer in baking dish. Add wine to pan, then add lemon juice and at least 2 more tbsp butter to this mixture, cook down. 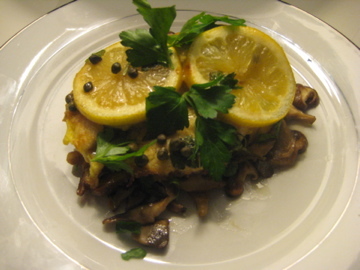 Place lemon slices on top of chicken in baking dish, sprinkle capers over all. Pour lemon/wine sauce on top, place parsley sprigs throughout dish. Bake in 350 degree oven for 20 to 25 minutes. Remove parsley and replace with fresh.